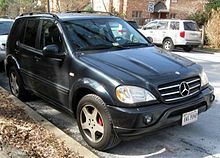 The Mercedes-Benz GLE-Class, formerly Mercedes-Benz M-Class, is a executive luxury SUV produced by the German automaker Mercedes-Benz since 1997. In terms of size, it is slotted in between the smaller GLC-Class (based on the C-Class) and the larger GLS-Class, with which it shares platforms. For a short time, between 1999 and 2002, the M-Class was also built by Magna Steyr in Graz, Austria, for the European market, before all the production moved to the U.S. plant near Vance, Alabama. From late 2012, the M-Class was also assembled at new plants in India and Indonesia. Since April 2015, the M-Class has been renamed to GLE-Class. Although grouped under the "M-Class" naming banner since the first launch, BMW, who sells M models such as the M3, objected to the car being badged "M" with the three-digit engine level afterwards (e.g. M 320). This forced Mercedes-Benz to defer to a double-tiered marketing strategy of "ML" badging (e.g. ML 320) under an M-Class umbrella. There has been some confusion surrounding this nomenclature, with many sources erroneously referring to the series as the "ML-Class", including Mercedes-Benz itself. From 2015, with the release of the facelifted W166 third generation model at the New York Auto Show in April, the M-Class was renamed to GLE-Class as per the revised nomenclature adopted by the brand. Under this scheme, SUVs use the base name "GL", followed by the model's placement in Mercedes-Benz hierarchy. The "G" is for Geländewagen (German off land wagon for off-road vehicle) and alludes the long-running G-Wagen. This is followed by the letter "L" that acts as a linkage with the letter "E"—the GLE being the SUV equivalent to the E-Class. Mercedes-Benz proposed a plan to replace the G-Class, which at the time had been in production for 11 years. A joint agreement with Mitsubishi Motors to develop and produce a sports-utility vehicle was made in early 1991 and was confirmed publicly that June. Plans were made to base it on the Montero/Pajero platform, with one of them being badged as a Mercedes-Benz and the other a Mitsubishi. In May 1992, these plans were abandoned citing "technical problems" and Mercedes-Benz continued on with in-house development from January 1993. In March 1993, a search for a location to build a U.S. manufacturing plant began. By September 1993, a location in the state of Alabama was chosen and construction started in 1994. While plans were being made overseas, in Germany development continued. Design work took place from late 1992 to 1994. A design from Mercedes' Sindelfingen studio was chosen in 1993 and approved by the executive board in February 1994. The design patents were filed in Germany on 13 July 1994, and in the U.S. on 13 January 1995. Prototype testing started with test mules and crash tests using mock-ups in May 1994. First functional prototype's crash test took place in February 1995, with full testing run from March 1995 to December 1996 in various climates and regions of the world. Pilot production began in May 1996. In July 1996, construction on the Mercedes-Benz U.S. International plant in Vance, Alabama concluded, with the very first production M-Class rolling off the assembly line the week of 9 February 1997. The Mercedes-Benz M-Class (W163) was available with permanent 4Matic four-wheel drive, which routed torque to all four wheels through all open front, center, and rear differentials. The system used a two-speed dual range BorgWarner 4409 transfer case with reduction gearing, and Mercedes' new Four-wheel Electronic Traction System (4-ETS). 4-ETS simulated three differential locks on all three open differentials, via aggressively braking one or more spinning wheels. Four-wheel, electronic traction system was said to perform excellent for snow and heavy off-road use. Manufactured in Vance, Alabama, in the United States, the M-Class launched in the North American market first as the ML 320. The ML 320 was sold internationally, with the "320" suffix alluding to the 3.2-litre V6 engine. An entry-level, manual transmission-only ML 230, fitted with a 2.3-litre inline-four was available in Europe from launch in March 1998 until 2000. From launch in 1998, European markets also received the ML 270 CDI with a 2.7-litre inline-five turbodiesel engine. This unit was made available in Australia in 2000 and continued on in the W163 until being replaced upon the release of the W164 M-Class in 2005. Later, in 1998, the more powerful ML 430 became available with the newly introduced Mercedes-Benz 4.3-litre V8. This was followed by the February 1999 debut of the 2000 ML 55 AMG, featuring a 5.4-litre V8 engine made by AMG, modified bodywork, and other performance features. Mercedes-Benz ML 320 used in The Lost World: Jurassic Park in the Mercedes-Benz Museum. In September 1996, before the vehicle was launched, Mercedes-Benz allowed the producers of the 1997 film The Lost World: Jurassic Park to make use of modified pre-production M-Class SUVs as a way to advertise the W163 when it was launched in 1997. As a result, a Mercedes-Benz advertisement appears before the film on original VHS copies of the film. Jeff Goldblum, the star of the film, received a complimentary ML 320 from Mercedes-Benz as a result of the tie-in. Three versions were used in the movie, of which 2 copies of each were built. Two are displayed at the Universal Studios in Orlando, Florida, there is one at the Mercedes-Benz Museum in Stuttgart, Germany, and one at the Visitor Center at the M-class factory in Alabama. The ML 320 was Motor Trend magazine's Truck of the Year for 1998 and was voted the 1998 North American Truck of the Year at the North American International Auto Show, Detroit, in January 1998. It also received the World Car Award in March 1999, voted by an international jury of automotive journalists in Geneva. Despite the accolades, Mercedes-Benz received considerable criticism with respect to the substandard quality of the W163. Quality improved over the years, especially after the facelift in 2001 for the 2002 model year. DaimlerChrysler spent US$600 million on improvements at the Alabama factory before launching the second generation ML in 2005. Mercedes-Benz revised and updated the W163 in 2001 for the 2002 model year. Styling updates involved the fitment of new head- and tail-lamp lenses, front and rear bumpers, new alloy wheels on most variants, the relocation of the side turn signals from the fenders to the side-view mirrors, and various interior trim changes. At the same time, the ML 430 was replaced by the 5.0-litre V8-powered ML 500 and a new 4.0-litre V8 turbodiesel ML 400 CDI became available in Europe. 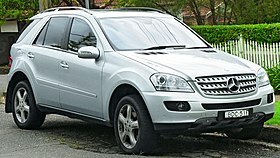 The following year, in 2002, Mercedes-Benz launched the ML 350 fitted with a 3.7-litre V6 engine. The ML 350 replaced the ML 320 in some markets, but supplemented it in others. The W163 was available as a seven-seat version, with two seats in a third row. Access was problematic and the seats were not suitable for large adults so the seven seater ML-Class was discontinued after the 2005 model year and replaced by the larger GL-Class. The previous Popemobile was based on a W163 series ML 430 and has been in service since July 2002. Volkswagen had offered to build a new vehicle based on the Touareg, but Pope Benedict XVI opted to continue using his predecessor's Mercedes-Benz-manufactured vehicle. In 1999, development on a successor to the W163 began under the codename "W164" and spanned a period of 6 years. By late 2001, the production design styled by Steve Mattin under Peter Pfeiffer was chosen and approved by the executive board in 2002. The design patents were filed in Germany on 10 June 2003, and in the U.S. on 25 July. Prototype testing was conducted throughout 2003 and 2004, concluding in early 2005. The redesigned M-class (chassis name W164) was introduced in April 2005 as a 2006 model after a showing at the North American International Auto Show in January. It was almost entirely new, with a more sporting, aerodynamic look—the coefficient of drag went down to 0.34 compared with the previous generation. Mercedes-Benz has also made the new M-Class 71 mm larger, 150 mm longer and 5 mm lower than the first model. The M-Class was named "Best New Sport Utility Vehicle" in the 2006 Canadian Car of the Year awards. Mercedes-Benz extensively publicised the US$600 million spent to update its factory and add manufacturing space for the new R-Class. According to early automotive press reports, the 2006 M-Class vehicles demonstrated vast improvements in quality. The W164 platform used for the new M-Class is shared with the new GL-Class and is a unibody type rather than the former (W163) body-on-frame used by the M-Class vehicles produced from 1998–2005. The X164 GL-Class, a longer seven-seater version of the W164 platform, is also available. New features in the 2006 M-Class include the 7G-Tronic seven-speed automatic transmission, optional Active Curve-Illuminating Bi-Xenon headlights which "steer" in the path of the vehicle, and an adjustable-height air suspension. The manual transmission has been dropped. Permanent 4Matic four-wheel drive remained, with one-speed transfer case (no low range), center limited-slip differential and four-wheel electronic traction system (4-ETS). In most countries except the U.S., an Off-Road Pro package with center and rear differential locks, 4-ETS, two-speed transfer case with reduction gearing, and adjustable ground clearance was available as an option increasing the original fording depth from 500 mm to 600 mm. The AMG version of the W164, the ML 63 AMG, was introduced at the 2006 North American International Auto Show as a limited edition 2007 model. It features a 6.2 L M156 V8 engine producing 510 PS (375 kW) and 465 lb⋅ft (630 N⋅m) that is handcrafted in Germany. The engine is added to an AMG Speedshift 7G-Tronic seven-speed automatic transmission. The 2006 ML 63 AMG can accelerate from 0–60 mph (96 km/h) in just 4.8 seconds, or from 0–62 mph (100 km/h) in just 5.0 seconds. These impressive features made the ML 63 AMG the most powerful naturally aspirated V8 SUV in the world. By 2007, design work on updates to the W164 were finalized and patented domestically in Germany on 23 November 2007. The 2009 Mercedes-Benz M-Class got a minor facelift as it debuted at the 2008 New York International Auto Show in March 2008. This facelift includes new front headlights, redesigned front and rear bumpers, new exterior mirrors, new rim choices, a larger front grille, restyled interior, and a new ML 420 CDI engine choice. The ML 280 CDI became the ML 300 CDI, the 320 CDI became the 350 CDI, and the 420 CDI became the 450 CDI. Models using Bluetec Diesel engine with urea injection were introduced in 2008 for the 2009 model year. At the 2009 New York International Auto Show, Mercedes-Benz showed their ML 450 Hybrid SUV, which was announced on 8 April 2009. The ML 450 Hybrid consumes almost 50% less fuel than the ML 550 does, even though it produces over 90% of the power generated by the V8 model. Total power generated will be 335 hp (250 kW) and 381 lb⋅ft (517 N⋅m) of torque, while getting 24 mpg‑US (9.8 L/100 km) on the highway and 21 mpg‑US (11 L/100 km) in the city, according to United States Environmental Protection Agency (EPA) estimates. The engine itself runs on the Atkinson cycle and by itself makes 275 hp. The ML 450 was developed under the Global Hybrid Cooperation, and will only be available in the United States under lease. In 2006, development began on the next-generation M-Class and spanned over a period of 5 years, a much shorter duration than its predecessor. In 2008, the final design by Emiel Burki was approved and patented domestically on 16 December 2008 (U.S. design patent filed on 15 June 2009). The newly redesigned M-class (chassis name W166) was introduced in pre-production form 10 June 2011 as a 2012 model. The first customer-designated W166 rolled off the Vance production line on 20 July. It is moderately refined, taking styling cues from the new generation Mercedes-Benz E-Class. An increase in rear seat legroom has been implemented, alongside adjustable rear back-rests. It was to be launched in September 2011. New features in the 2012 M-Class include an updated 7G-Tronic Plus seven-speed automatic transmission to provide improved fuel economy, optional Adaptive Cruise Control (Distronic Plus), Active Lane Departure Warning System, and an adjustable-height air suspension (AirMatic). An ACTIVE CURVE SYSTEM with active anti-roll bars for body roll compensation was introduced. The W166 was one of the last vestiges of the joint venture between Daimler and Chrysler while they were a consolidated company. DaimlerChrysler developed the core platform and technology, benefitting from Chrysler's strong SUV sales and R&D domestically. The underlying platform work was largely completed in 2006, as the two companies were separated. Chrysler uses the same platform to power the Jeep Grand Cherokee (WK2) and Dodge Durango. Because of the separation however, the cars are extremely different in terms of interior and body design as well as engine choices. Aside from engines, the three SUVs share many powertrain components, including some transmissions. An On&Off Road Package is available for most markets (now including North America) as of the 2013 model year. The package adds a two-speed dual range Magna Powertrain transfer case with center differential lock, reduction gearing, underbody skid plates, and a 6-mode selectable terrain driving program system. The rear differential lock has been discontinued. Open front and rear differentials are fitted, and use four-wheel electronic traction system (4-ETS) to simulate front and rear differential locks. The Mercedes M-Class won first place in the "Luxury Crossover SUV" category and has been named the most ideal vehicle for Americans based on a study undertaken by California-based automotive research and consulting firm AutoPacific. Mercedes-Benz India established a manufacturing plant in Chakan, Pune in early 2009 that rolled out the first W166 M-Class to be built outside the US in October 2012. In the following month, Mercedes-Benz Indonesia began M-Class assembly at a factory in Wanaherang, West Java. These plants perform final assembly of vehicles shipped as "knocked-down" kits from Vance, USA. In the second half of 2015 a facelifted W166 will be released as the GLE, along with a coupé version. The previous Popemobile was based on the 2012 M-Class and was delivered in December 2012. The Mercedes-Benz GLE-Class is a sport utility vehicle (SUV) built by the German car manufacturer Mercedes-Benz. The GLE-Class name was used in 2015 for the facelifted Mercedes-Benz M-Class (W166) and the new five-door coupé derivative GLE-Class Coupe (C292) which was unveiled to the public in January 2015 at the North American International Auto Show. As part of Mercedes-Benz's new naming strategy, the GLE-Class will define the SUV's positioning in the middle of its segment and between the future GLC and GLS-Classes (the former GLK and GL, respectively), the same way the E-Class is positioned in relation to the C and S-Classes. The W166 facelift version was unveiled at the New York Auto Show. The GLE 500 e is the first plug-in hybrid in this model range, combining a 333 hp V6 engine with a 116 hp electric motor. The first 19 units were delivered in the American market in June 2016. The Mercedes-Benz GLE-Class Coupe (C292) is the coupé version and is heavily related to the W166, sharing its platform, mechanicals and interior (but having a completely unique body with a similar design). The C292 coupe was unveiled to the public in January 2015 at the North American International Auto Show. The GLE Coupé will be built in Alabama with the future GLE-Class on which it is based. Sales are expected from the second half of 2015. The range is topped by the Mercedes-AMG GLE 63 S-Model, powered by a new 5.5-litre twin turbo V8 producing 585 bhp and 768 Nm of torque, making it one of the quickest of its type. 1 vehicle structure rated "Acceptable"
The fourth generation GLE-Class was unveiled at the 2018 Paris Motor Show. It is scheduled to go on sale in the USA in the end of Q1 2019. At launch, the GLE will be sold with two engine options. The GLE 350 will have a 2.0 4 cylinder engine with 255 bhp and the GLE450 with a 3.0 inline 6 turbocharged engine with 362 hp (367 PS; 270 kW) and 369 lb⋅ft (500 N⋅m) torque. The GLE450 will have a 48V electric system with an integrated starter motor. The system powers the air-conditioner, in-car electronics and the electronically driven turbocharger. The AMG GLE 53 was introduced at the 2019 Geneva Motor Show in March. It has a 3.0 L turbo I6 boosted to 429 hp (435 PS; 320 kW) and 384 lb⋅ft (521 N⋅m) torque. A 48V electric system like in the GLE450 features EQ Boost for an extra 21 hp (16 kW) and 184 lb⋅ft (249 N⋅m) torque on demand. ^ Meiners, Jens (25 August 2014). "Mercedes-Benz to Revise Nomenclature: M-class First Up, Becomes GLE-class Early Next Year". Car and Driver. Retrieved 27 August 2014. ^ Perlas, Giancarlo (13 December 2012). "Explained: Why it's the M-Class and not ML-Class". BenzInsider. Retrieved 7 December 2015. ^ Sarne, Vernon B. (17 May 2012). "Is it M-Class or ML-Class?". Top Gear Philippines. Archived from the original on 5 June 2012. ^ "Energy consumption in real time". Mercedes-Benz. 2014. Archived from the original on 2 October 2014. ^ "Mercedes-Benz ML-Class (Australia) Specifications as of 7 August 2014" (PDF). Mercedes-Benz Australia/Pacific. 13 August 2014. Archived from the original (PDF) on 21 November 2014. ^ "Mercedes, Mitsubishi discuss sharing sport-utility". The news. Retrieved 13 October 2012. ^ "Mitsubishi drops plan with Mercedes". The press courier. Retrieved 13 October 2012. ^ "Mercedes-Benz M-Class". Google. Retrieved 31 March 2015. ^ a b "1998 Mercedes-Benz ML". 4wheeloffroad.com. Retrieved 16 September 2012. ^ "Tenth anniversary of the M-Class: Premiere at the Vance plant in 1997 – Daimler Global Media Site > Classic > Mercedes-Benz Cars > Mercedes-Benz Passenger Cars > M-Class". daimler.com. 11 June 2008. Retrieved 31 March 2015. ^ "Daimler Global Media Site > Classic > Mercedes-Benz Cars > Mercedes-Benz Passenger Cars". daimler.com. 17 February 2011. Retrieved 31 March 2015. ^ "2005-07-08 Pontiff Withholds Blessing From VW's Proposed Popemobile". Edmunds.com. Archived from the original on 7 July 2009. Retrieved 1 October 2010. ^ CGT union on production transfer rumours. "Interview with Steve Mattin, Senior Designer, Mercedes – Benz". Just-auto.com. Retrieved 29 September 2012. ^ "Mercedes ML 450 HYBRID". Automoblog.net. Archived from the original on 14 February 2012. Retrieved 6 January 2012. ^ Abuelsamid, Sam (14 November 2009). "Mercedes-Benz ML450 Hybrid launches next week for lease only – Autoblog Green". Green.autoblog.com. Retrieved 21 March 2010. ^ "United States Patent D0643339". Intellectual Property EXchange Limited. Retrieved 15 April 2016. ^ Pettendy, Marton (22 July 2011). "Benz confirms next GL-class". GoAuto. John Mellor. Retrieved 23 July 2011. ^ "ACTIVE CURVE SYSTEM – Daimler > Technologie & Innovation > Sicherheit > Vorbeugen". daimler.com. 21 June 2013. Archived from the original on 26 May 2015. Retrieved 31 March 2015. ^ "2013 Mercedes-Benz M-Class". leftlanenews.com. Retrieved 30 September 2012. ^ "Mercedes-Benz M-Class Wins 2013 Ideal Vehicle Award in the US". autoevolution.com. Retrieved 15 August 2013. ^ "Mercedes-Benz Inaugurates New Manufacturing Plant in Pune, India – Daimler Global Media Site > Brands & Products > Mercedes-Benz Cars > Mercedes-Benz Passenger Cars > Special Topics". daimler.com. 7 July 2011. Retrieved 31 March 2015. ^ Lalatendu Mishra. "Mercedes-Benz rolls out M-Class luxury SUV from Pune facility". The Hindu. Retrieved 31 March 2015. ^ Tan, Danny (23 November 2012). "Mercedes-Benz assembles M-Class SUV in Indonesia". Paul Tan’s Automotive News. Retrieved 15 April 2016. ^ a b "Technical data C-Class". Media.daimler.com. 18 January 2007. Retrieved 29 September 2012. ^ a b "2015 Mercedes-Benz GLE Coupe revealed". What Car?. 9 December 2014. Archived from the original on 13 January 2015. Retrieved 13 January 2015. ^ a b "Première for the Mercedes-Benz GLE and Mercedes-AMG GLE 63: Efficiency meets performance – Daimler Global Media Site > Brands & Products > Mercedes-Benz Cars > Mercedes-Benz Passenger Cars > GLE". daimler.com. 31 March 2015. Retrieved 14 October 2018. ^ Cole, Jay (1 July 2016). "June 2016 Plug-In Electric Vehicle Sales Report Card". InsideEVs.com. Retrieved 4 July 2016. ^ "Mercedes GLE Coupe Takes on BMW X6 for Sporty SUV Buyers". Bloomberg L.P. 12 January 2015. Retrieved 13 January 2015. ^ "Mercedes-AMG GLE 63 Coupe debuts at Detroit Show". Auto Express. 12 January 2015. Retrieved 13 January 2015. ^ "2013 Mercedes-Benz ML-Class SUV 4WD". U.S. Department of Transportation. Retrieved 23 September 2015. ^ "Euro NCAP – Mercedes-Benz M-Class (2002)". euroncap.com. Retrieved 31 March 2015. ^ "Vehicle details". iihs.org. Retrieved 31 March 2015. ^ "Mercedes-Benz USA Records Highest Sales in Its History. – Free Online Library". Thefreelibrary.com. 3 January 2003. Retrieved 25 April 2011. ^ "2004 Highest Year on Record for Mercedes-Benz USA". Theautochannel.com. Retrieved 25 April 2011. ^ "Mercedes-Benz Rings in the New Year with Record 2006 Sales". Theautochannel.com. Retrieved 25 April 2011. ^ "Mercedes-Benz USA's Sales Drop 32.1 Percent in December 2008". Emercedesbenz.com. 5 January 2009. Retrieved 25 April 2011. ^ "Highest Sales Month for the Year at 21,469 Brings Mercedes-Benz to an... – MONTVALE, N.J., Jan. 4, 2011 /PRNewswire/". New Jersey. PR Newswire. Retrieved 25 April 2011. ^ "December 2010 Dashboard: Year End Tally". Hybrid Cars. 7 January 2011. Archived from the original on 12 July 2011. Retrieved 25 April 2011. ^ "Mercedes-Benz Records the Highest Year on Record with Sales of 264,460 – MONTVALE, N.J., Jan. 5, 2012 /PRNewswire/". New Jersey. PR Newswire. Retrieved 18 May 2012. ^ Mercedes-Benz USA (5 January 2015). "Mercedes-Benz Delivers Record-Breaking 2014 Sales Volume of 330,391, Up 5.7%". PR Newswire. Retrieved 31 March 2015. ^ "Mercedes-Benz USA Reports Best Year Ever With 2016 Sales Of 380,752 Units".